Royal Caribbean International’s latest Ovation of the Seas has officially joined the fleet, named its godmother and set out to display 11,000 pieces of art. 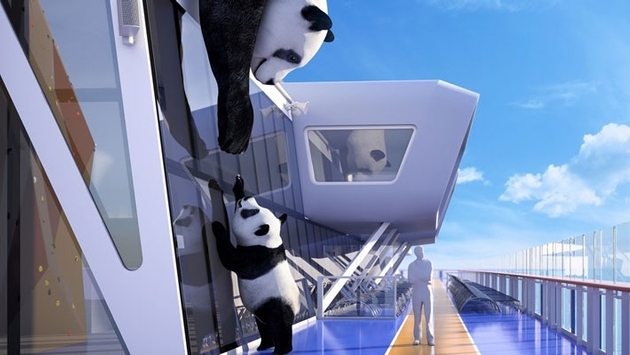 Included is the third Quantum-class ship’s signature on-deck animal sculpture, this time of adorable pandas (rendered above). You can view a video celebrating the ship’s welcoming into the Royal Caribbean family, hosted at my Popular Cruising YouTube channel and embedded below. The ship arrived in Southampton, U.K where it will head out on its epic 52-day Global Odyssey voyage this week. To join in on the excitement, you can also watch a video time-lapse of the ship arriving into the British port just below. As the Ovation of the Seas will partially homeport in China, its godmother will be Chinese actress, Fan Bingbing (pictured below), who will name the vessel during its inaugural ceremony in Tianjin, China on June 24, 2016. 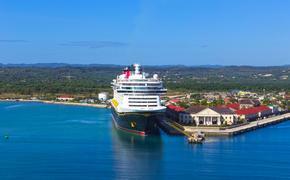 Some other celebrity godmothers who have previously officiated over Royal Caribbean ships are performer Gloria Estefan, actress Jane Seymour, comedian/actress Whoopi Goldberg and tennis champion Steffi Graf. The 11,000 piece art collection onboard Ovation is worth $4.5 million and is inspired by Confucius’ “wherever you go, go with all your heart” quote. Appropriately showcased for China is the country’s native panda bear in a cute display of “Mama and Baby” reaching for each other around the ship’s SeaPlex venue. They also represent the line’s recent partnership with World Wildlife Fund, whose logo is of a panda. Another piece, the “Sky Wave” installation is also featured in video below. Royal Caribbean says it’s the first ever kinetic moving sculpture at sea. 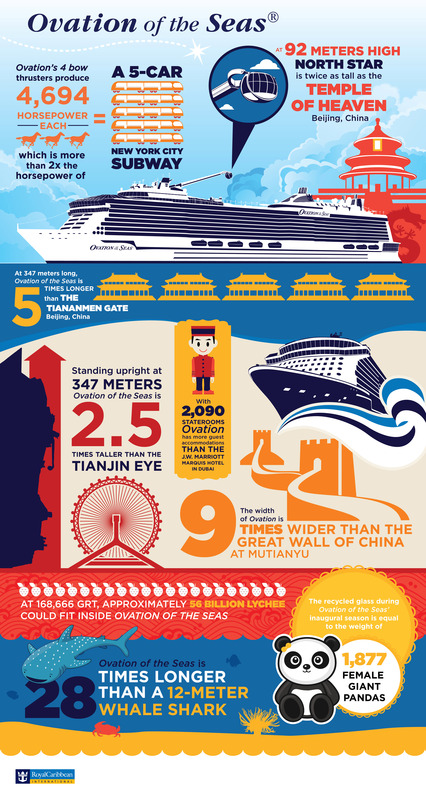 And just for fun, here’s a bonus infographic about the Ovation of the Seas provided by the line.